Junior League of Greater Princeton Holiday Showhouse & Gardens – The Junior League of Greater Princeton is hosting another designer showhouse, this time with a holiday theme. Funds raised during the Designer Showhouse allow the League to implement two years of community programs, including a partnership with Dress for Success in Mercer County and a health and wellness program for local preschoolers. Visit the magnificent brick Georgian at 159 Library Place, Princeton. Fifteen interior design spaces, as well as exterior lawn and garden areas, provide local designers and landscape architects unique opportunities to showcase festive holiday decorations. The home tour includes a Community Giving Tree, Pop-Up Art Gallery, Holiday Cabana Boutique and Junior League – Past, Present, Future exhibit. Author and lifestyle expert Maureen Petrosky will be featured at a special event and book signing Saturday at 1 p.m. Showhouse hours are Thursday, Saturday and Sunday 11a.m. to 4 p.m. and Friday 11 a.m. to 8 p.m. Tickets $35 at the door. Make Your Own Kale Chips with The Kitchen Twins – The Kitchen Twins, 11-year-old Emily and Lyla Allen, want to encourage kids to get involved with fresh and healthy foods at an early age. Inspired early on by their parents’ natural food business, the twins turned their passion for healthy eating and kitchen creativity into a blog. The Kitchen Twins will be demonstrating and sampling their new Make-Your-Own Kale Chips 4:30 p.m. to 6 p.m. Pennington Market, 25 Route 31 Pennington. Dodgeball, Anyone? Corner House will host the annual All City High school Dodgeball tournament tonight at 6 p.m. in the new gym at Princeton High School. The event is free to watch and open to the pubic. High school students from Princeton High, Princeton Day School, Hun and Stuart can sign up until the end of the day Friday. School co-chairs for this event, for those who still want to sign up: Catherine Curran-Groome (PHS), Matt Riley (PDS), Rachelle Brioche (Stuart) and Taylor Nehlig (Hun). Pianists at an Exhibition – The Princeton Pianists Ensemble’s 3rd Annual Piano Extravaganza, is a play on Mussorgsky’s “Pictures at an Exhibition.” The program will showcase Russian music from Stravinsky to Shostakovich, Rachmaninoff to Rimsky-Korsakov. Works will be performed by Princeton University student musicians on two to five pianos, highlighting the exciting and unique possibilities presented by a purely collaborative piano ensemble. 7:30 p.m. Friday and Saturday, McAlpin Hall, the Woolworth Center, Princeton University. Admission $7. Joel Mabus in Concert – The Princeton Folk Music Society presents nationally known singer and songwriter and instrumentalist Joel Mabus, a maverick in the folk music world, whose performance defies any easy pigeonhole. By turns, he picks a mountain banjo to accompany an ancient ballad, sings a witty song about modern life, plays a sweet Irish melody on guitar, swings a hot jazz number, and then reaches deep for a soulful expression of values in a troubled world. He tops it all with a fiddle tune or old Carter family song – all skillfully blended into a seamless flow. 8:15 p.m., Christ Congregation Church, 50 Walnut Lane, Princeton. Admission $20 ($15 members, $10 students, $5 children). Tina and Friends Rock the Vines, Live Music and Open Mic – Once a month, Unionville Vineyards hosts live music and open mic night with local songstress Tina Margot. Due to the Thanksgiving holiday, November’s Tina and Friends is on the third Friday, not the fourth. Snacks and wines by the glass or bottle. Outside food is permitted. Outside alcohol is not permitted. 6:30 p.m. to 9:30 p.m. Unionville Vineyards, 9 Rocktown Road, Ringoes. No cover. The Doo Wop Project Visits McCarter Theatre – Take a musical trip down memory lane with five leading cast members from several leading Broadway shows: McCarter favorite Jarrod Spector (currently starring in the new smash hit Beautiful: The Carole King Musical), plus Dominic Nolfi, Dwayne Cooper, Charl Brown, and Dominic Scaglione. With The Doo Wop Project, they pay homage to the music that was inspired by the Doo Wop sound—songs and groups we hear all the time, or exist only as a memory, or got lost along the way. 8 p.m. Matthews Theatre, 91 University Place, Princeton. Tickets $30 and up. Pennington Farmers Market – Last market of the year. Celebrate Thanksgiving with organic vegetables, cheeses, meats, wines, desserts and more. Locally grown and produced wine, cheese, sausage, teas, desserts, and preserves make terrific gifts for that special neighbor, dog walker, hostess, leader, mentor, coach, mechanic, or IT specialist who helped out this year. Take a break from holiday shopping and enjoy a delicious lunch from Terra Momo or Lincoln Creek. Vendors include: Chickadee Creek, Beechtree Farm, Fulper Farms, Hopewell Valley Vineyard, Terra Momo & Camella Sauces, Sacred Roses, Lincoln Creek Smokehouse, Judith’s Desserts, Stace of Cakes. 9-1 (rain or shine) under the eaves at Rosedale Mills. 101 Route 31 North in Hopewell Township. West Windsor Community Farmers’ Market – Last day of the seasons. Produce, flowers, baked goods, music. Yes We Can food drive. Free tree saplings from Girl Scout troop 71806. Used baseball and softball equipment drop off for West Windsor Little League. 9 a.m. to 1 p.m. Vaughn Drive Parking Lot, Princeton Junction Train Station, West Windsor. YWCA’s 41st Annual Crafters’ Marketplace Weekend – Juried show exhibits more than 90 artisans and their handcrafted goods. Held the weekend before Thanksgiving, it draws more than 2,000 shoppers annually from the surrounding communities. All proceeds from this event support the YWCA Princeton’s Pearl Bates Scholarship Fund which provides financial assistance for participants in YWCA Princeton programs. 10 a.m. to 5 p.m Saturday, 11 a.m. to 4 p.m. Sunday, John Witherspoon Middle School, 217 Walnut Lane, Princeton. 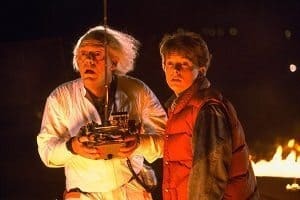 “Back to the Future II” Kids Matinee – Special family screening of “Back to the Future” at the Garden Theater. 10:30 a.m. Nassau Street. Free. Princeton Football vs. Dartmouth – Last home game of the season. Princeton Stadium. 1 p.m. kickoff. Admission $10, $6 for children. Princeton Men’s Basketball vs. Incarnate Word – The Tigers play ball at 11 a.m. in Jadwin Gym. Tickets $12. Café Improv – Music, poetry, comedy and more at the Arts Council of Princeton. 7 p.m. to 10 p.m. Stay for the entire show or drop in when you want. 102 Witherspoon Street, Princeton. Admission $2, $1 for students, seniors and Arts Council members. Princeton University Concert Jazz Ensemble Performs – Dr. Anthony D.J. Branker leads the group, which is joined by vocalist and pianist Alison Crockett and the Alison Crockett Trio, featuring bassist Tarus Mateen, and drummer Jabari Exum. The program features music from Ms. Crockett’s one-woman show Is This It? My American Dream. 8 p.m., Richardson Auditorium, Alexander Hall, Princeton University. Tickets $15, students $5. L’Avant-Scène to perform ‘La Musica Deuxième – The French theater troupe L’Avant-Scène will perform “La Musica Deuxième” by Marguerite Duras in the Sterling Morton Gallery of the Princeton University Art Museum. The play, written in 1985, tells the story of a couple who meet again three years after their divorce and revisit their haunting past. Performances are in French. Friday and Saturday, 8 p.m. The Princeton University Art Museum. Free. Divine Winds – The Richardson Chamber Players perform works by Mozart, Poulenc, and more. 3 p.m. Richardson Auditorium, Admission $15. North Pole Express – Take the New Hope & Ivyland Railroad and ride the rails with Santa, Mrs. Claus and a host of holiday revelers. Children and adults of all ages are invited to ride the special holiday train, sip hot cocoa and enjoy cookies while Santa visits with each child and presents them with a special gift. Local musicians play and sing Christmas carols for all to enjoy and participate in. Trains depart at 5:15 p.m. and 6:45 p.m. on Friday, Saturday and Sunday. All ages. Adults: $45.95; Children (2 to 11): $43.95; Toddler (under 2): $12.95. 32 West Bridge Street, New Hope, Pa. Gun Violence Prevention Forum – Reed Gusciora, deputy majority leader of the New Jersey State Assembly, will be the keynote speaker. Panelists include Glen Miller, Ocean County Prosecutor’s Office and former NJ State Trooper, Reverend Bob Moore, Coalition for Peace Action, Rabbi Joel Mosbacher, Congregation Beth Haverim Shir Shalom in Mahwah, Gianni Pirelli, clinical and forensic psychologist, and Mandy Perlmuter, NJ Chapter Lead of Moms Demand Action for Gun Sense in America. 4 p.m. Princeton Jewish Center, 435 Nassau Street, Princeton. Free. Pet Photo Night at Quaker Bridge Mall – It’s your fur-babies time to get their picture taken with Santa Claus! Bring your cats and dogs to Quaker Bridge Mall after hours on Sunday to get their Christmas photos taken. Pet parents are encouraged to enter in Court Mall entrances only. 6:30 p.m. to 8:30 p.m. 150 Quaker Bridge Mall, Route 1 North, Lawrence.